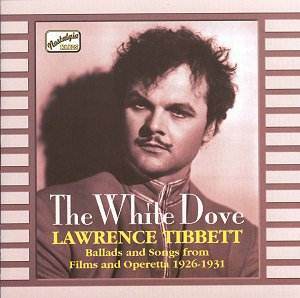 Listening to this disc of Lawrence Tibbett recordings from 1926-1931 I felt pleased once again to have lived to hear the results of such brilliant technology enabling us hear vintage recordings of songs from as long ago as this. I do confess to having to cast my mind back to those far off days and try to recall if Lawrence Tibbett was a name I knew well then. Vaguely the thought came into my mind that I must have heard him then, but I suspect there were other singers – Dawson, McCormack and Tauber - who figured more in my listening. Lawrence Tibbett was certainly once called the "Voice of America" but I don’t recall that cutting much ice here in England. This made me very eager to listen to this CD to see if this was a trifle exaggerated. I must say hearing him sing "Thy Beaming Eyes" with the Victor Studio Orchestra conducted by Rosario Bourdon in 1926 I wasn’t very impressed. Mainly because Tibbett appeared more intent on singing as you would expect to hear from an opera singer rather than a popular singer which I don’t think is really appropriate in a song like this. Also many of the words are lost somewhere in the music and that is always a minus for me. What you hear is a quiet and serious song but to me it lacks the necessary feeling. Not a good start then. I liked the next song, "Oh, that we two were maying" with the same orchestra from a month before. This time you are able to hear every word and by the end I realised what a fine baritone voice Tibbett had, perhaps even why he became a singer of such status. That lovely old song "Drink To Me Only With Thine Eyes" was recorded the following year and Tibbett sings it with feeling and some passion. You can hear how his voice changes with the words of the song. The same can be said for Foster’s "Old Black Joe" also recorded in 1927. Tibbett sings about old Joe the slave as if he really is singing of one man in particular. Again every word is clear as Tibbett sings it very slowly, and so you are compelled to listen. Like many others of the 1920s this is another song that has survived down the years, another one that will always be remembered, but perhaps not quite in the same slow deliberate voice of Lawrence Tibbett which would be a pity. "Uncle Ned" was recorded in the same 1927 sessions with the Victor Studio Orchestra also. This one is a story song, a very sad story song, but I think Tibbett sings it near-perfectly and with all the emotion necessary for the story and Im did like the addition of the Shannon Quartet. This is a song that would probably have been a hit then in the 1920s and it’s one that can be appreciated now especially for how Tibbett sings it. Next is a duet, "Calm as the night", with Tibbett joined by the soprano Lucrezia Bori. Their two voices blend beautifully as they sing this essentially very simple song. I do have a feeling, and it is only that, that this song was popular at the time it was recorded in 1927, but it’s certainly a recording that is new to me now. I was delighted when I saw that Tibbett and Lucrezia Bori were by joined by Francis J. Lapitino on the harp for "Fairest Night of Starry Ray", much better know simply as the Barcarole from Offenbach’s "The Tales of Hoffman". This is wonderful. A recording that has come down through the years vividly too and I think is the highlight of the disc. Tibbett’s sheer confidence makes the most of every change that occurs in the melody. Likewise there is no adjective I can think of that will do justice to "Believe me if all those endearing young charms". This too is a wonderful song that I have heard many times over the years, though not in the same slow tempo as this or with such poignancy that Lawrence Tibbett brings to it. He asks you as he sings so plaintively to believe every word and you do. He makes use of his considerable voice when the song demands it, and the resonant sound of the orchestra combines to make this recording a delight. Never having ever heard "Crucifix (Come Unto Him)", which was recorded in 1928 as a duet with Richard Crooks with organ, my one thought was that I wished it would end quickly. I listened twice and then decided this was a song that is either from a dreary old opera best forgotten or perhaps a hymn equally best consigned to oblivion. I could still admire Tibbett’s singing of it, but this is definitely not a song I was drawn to in any way. Quite simply it bored me. In 1930 Tibbett recorded a selection from "The Rogue Song", an MGM romance directed by Lionel Barrymore in which Tibbett made his movie debut. "The Narrative" comes first and, once again, I listened to it several times trying to find something to like, but I couldn’t. The words were rather indistinct in this recording too so there is no way I could understand what it was all about either. I certainly didn’t like Tibbett’s absurd operatic laughs in it, obviously meant to be part of the song but just came over to me as forced. I can’t say I was impressed by the title song either having difficulty making out the lyrics. I wasn’t greatly impressed by "When I’m looking at you", but Tibbett certainly sings with panache and in a swashbuckling way that makes it pleasant to listen to. However, what a surprise I had when I heard the recording of "The White Dove", the title song of this CD. I found it hard to believe this lovely song also came from the same movie, but then a look at the credits told me this was written by Franz Lehar so perhaps that explains it. Tibbett sings it with such warmth and feeling that you can even imagine he is here singing it to someone very special. I can’t remember hearing this song being sung as well as this with the fullest use of the lyrics and with the Victor Studio Orchestra yet again accompanying so superbly. It is a song I am sure will never be forgotten when there are versions like this to be enjoyed. The famous "Lover come back to me" is from the show "The New Moon" by Romberg and Hammerstein and Tibbett sings this with passion and longing, and you are left in no doubt what he means here. Every word comes from the heart. What a tremendous voice he does have here and in such contrast so some of the others on this disc. I have to say that I do think he is at his best when singing the sentimental love songs. That he had a natural talent for this type of song more than any other. "Wanting You", recorded in the same year 1931, is another number from "The New Moon" and again Tibbett sings memorably of wanting someone so desperately, someone who he dreams of, and no one else would do. "Life is a Dream" is from another of the musicals Tibbett made for MGM, "The Southerner" (also known as "The Prodigal") and recorded in 1931. He sings very wistfully, telling us he has discovered that life is all about dreaming. This is another one of the many sentimental songs he sings so well and even if you don’t manage to make out all the words you’ll get the gist of what he is singing about. Another song from the same musical is the well known "Without a Song" which brings this disc to an end. For those who like me may have missed the impact of Lawrence Tibbett first time round this CD will be of interest. For others it is a rather patchy collection of songs that are well known and not so well known.